People used to search how to get the job fast? How does the Internet work in a Job Search? What successful job search strategies need to follow? More effective job hunting strategies in job posting sites? Why go online? New effective job search techniques in employment search sites to get started? Updated job search techniques 2017? How to conduct a successful job search? How to job hunt effectively at IT job posting sites and many more questions. Technology has become embedded into our daily lives and completely changed the way that we perform daily activities, such as setting an alarm clock on our phones and completing a simple Internet search. In a job search today, it is vital to leverage available technology in order to find opportunities that you may not learn of otherwise and bypass the competition still relying on traditional methods. Technology has enabled job seekers with new ways to connect with prospective employers and gain a competitive edge in the talent pool. 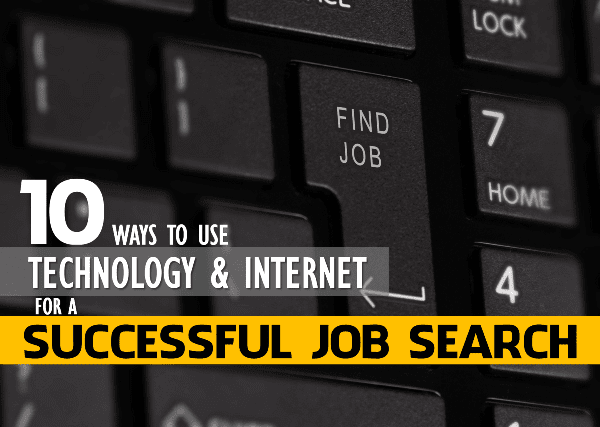 With so many resources available on the Internet, the most important step is to first plan on how to use technology for a successful job search. This will help you feel more organized and in control of the process, while also helping you produce quality results. Previous ways that job seekers interact with technology may need some reflection and adjustments, but it is well worth the effort in order to have an efficient and effective job search. For example, you may change up how you conduct an Internet search or update your email notifications. The preparation that goes into it and the commitment to leverage resources readily available will put job seekers that much closer to landing their next jobs. The open-ended competition is really tight and it's not only to fight for limited seats in some multinational businesses but also to fight against global job seekers as well. In the previous post I was talking about; Saturation – How To Overcome Long-term Unemployment the student who passed out from there universities, seems to slip into the trap of long-term unemployment. And again today I want to trigger them to use technology & internet to get the proper job that they want to settle themself into. Online job searches work with different strategies than traditional ones. But with a significant knowledge of searching the job appropriately & apply effectively, you can jump ahead of the competition and get the job that you would like to go. Basic changes to your use of employment search engines, job posting sites, direct corporate websites and email alerts can make your job search more effective and productive. But how? Follow each step to find out how to make use of Internet & technology for effective job searching that'll work for you. How to search for a job sffectively- A search engine is a great tool to use in your search but is important to use it effectively. A broad search can produce results you do not hone in on exactly what you are looking for and can even produce faulty information or limited information. To ensure an effective search, try switching up the order of the words you are searching for, try singular and plural terms and use quote marks to adjust the preciseness of your search. For example, you can try typing in “Human Resources Specialist” and “Specialist in Human Resources”, or typing in “job” vs. “jobs”. What is the best way to find a new job online? Your Internet search will come up with multiple sources, so keep an open mind for the resources that you explore. It is important to look in the right places and be sure to sift through your options. For example, your search might pull a job ad, a company career website, or a local job posting/newsletter. The more places that you look, the more you put your best foot forward and be confident that you are doing all that you can to land the right job. Creative & innovative online mobile app job sites - As you may already know, augmented reality is a technology that imposes a computer-generated image on a user’s view of a real-world environment. Augmented reality can be utilized by connecting where you are and what you are experiencing with the opportunities that surround you. Job search apps specifically can help by connecting you with opportunities that match your profile. On the Jobrapido App, for example, you can specify filters to hone in on vacancies that fit exactly what you are looking for. This can take off some of the stress from the job search as well as open your eyes to all the opportunity that is around you. Finding jobs at corporate websites - Company websites contain a lot of helpful information for each step of your job search. To find opportunities that are available, you can search their website for the job postings page. On the webpage, this header may be labeled “Careers”, “Employment” or “Work With Us”. If you find a position that you would like to apply for, you can do so directly. Often times, even if there is not a posting that matches your profile, there will be a section where you can submit your CV the company to express your interest in working for it. Company websites commonly have an ‘About Us’ page, as well. On the ‘About Us’ page, you can learn about the company values and other helpful information that you can use to craft your cover letter and even refer back to in an interview. Create job alerts on email - As you apply to positions, invest time in learning about different companies and put your profile out there, the more your email inbox will fill up. An organized inbox can help you keep track of general emails and those related to your job search. From there, you will want to keep track of the “Thank you for applying to ‘this position’” emails, the company updates and the application follow-ups. You can create and label folders for your email and set email alerts for when you receive an email from a specific company regarding a position or any other correspondence you would like to keep track of. As you organize your inbox, keep an eye out for knowledge subscriptions that you are signed up for. Blogs are a great method to keep updated on what is going on in the industries that you are interested in, as well as helpful information for readers, such as available job opportunities. Filter through what has caught your eye in the past, then subscribe to more blogs that have job listings and relate back to your job search and interests in general. Use modern resume templates - The interview process for many companies has evolved along with technology. Video interviews are quite popular and for applicants, a new CV form that aligns with this could help gain a competitive edge. By making your application interactive, your prospective employers gain a greater insight into your character and profile than what a simple paper CV can do. Multimedia, such as Slideshare.net, viral videos, and creative personal websites, can be used to help express interest as a candidate and really convey one’s personal brand. Get your resume mobile ready - Technology has enabled users to apply to jobs anywhere, anytime. This makes having a CV that is accessible and mobile all the more efficient. There are several tips you can rely on if you go mobile with your CV. If you do so, you are able to apply to positions directly as soon as you see it available (instead of running home to your computer to do so), send your CV over to recruiters on the go, and create a profile for a job site in minimal time. Impress with the killer video application - A video resume is a sure way to stand out in an application process. Not many people do one, but if done well, it can be used to deliver a story-like formatted resume. If you are shy in front of the camera or are uncomfortable in the process, do not worry about it! Connecting on the phone or in person can be your place to shine. But for those confident on camera, keep it short and upload the final version to YouTube! Use social media to land a job - Social media plays a large part in today’s society, with users across the world interacting with one another, as well as with companies. Social media, outside of Facebook and Instagram for personal use, can provide job seekers with tools, such as LinkedIn, to network online and cultivate old and new (even professional) relationships. Before optimizing social media to aid in a job search, it is crucial that a user has a social media spring clean first. Over 60% of employers will search for applicants on social media, so users must be sure that they would be comfortable with their potential boss/team seeing what they have posted. It is common to see a space to insert your social media profile in an application, and it may very well help sell your candidature if you insert each profile tag instead of having the recruiters dig for it. Many companies hire based off recommendations so it can be even more efficient to conduct a people search instead of a job search. If there is a direct connection at a company, a connection can be the one to pass on a CV and be a referral. Otherwise, a people search can be conducted to see a list of employers, find a connection and if there is not one, to make a connection. As the job search techniques evolve, the most effective job searches are completed when both the traditional approach and the social media approaches are combined. Social media savviness and networking is crucial in today’s world of business, but traditional approaches and the efforts are appreciated. While some say that your experience should speak for itself, there is always more to the story than what a simple piece of paper can convey. After all, a follow-up email post-interview is a must, but who doesn’t love a handwritten thank you note?